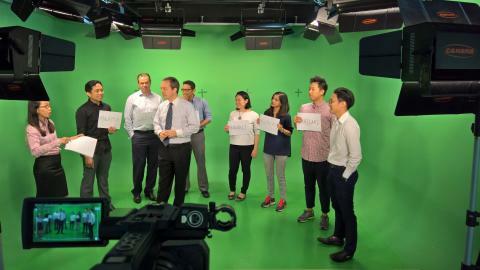 Senior Communications Directors from six organisations came together in the Hong Bao Media studio in Kuala Lumpur today (April 12) and produced a creative, quirky short video at the end of a crash course on in-house video production. It was all part of the Coaching Day of the Asia Pacific Association of Communications Directors (APACD), and a preview to HBM's 2-day video production course titled "Video Savvy - Video Essentials for Marketers" (see links below). 1. How to solve the people problem - sometimes there are too few, at other times too many stakeholders involved in the production. We discussed creative and effective ways to solve this problem. 2. How to determine the success of a video - not surprisingly, the number of views or 'likes' is not at the top of the list. The workshop had a long waiting list of participants. To attend the next workshop, non-members can either join APACD or contact Hong Bao Media directly for the Video Savvy course.